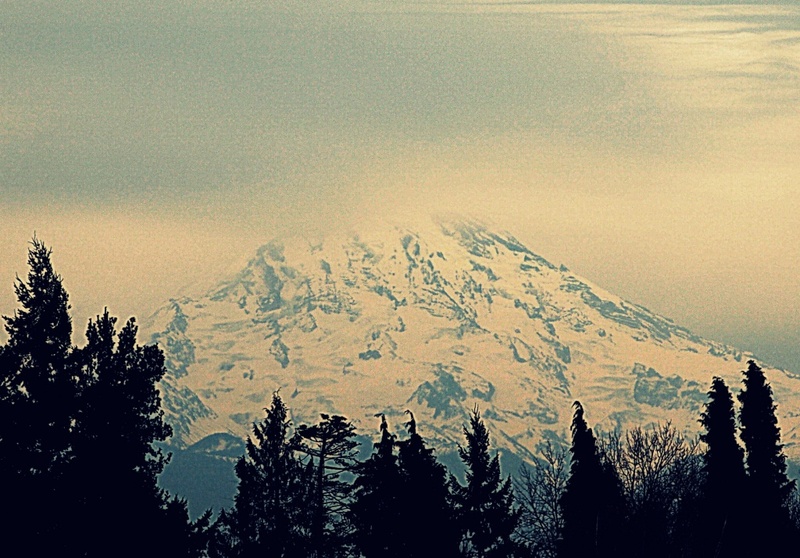 I'm rather happy with this edit considering how difficult it was to get a picture of the mountain on a very hazy day. Our office holiday party was today, held in Tacoma (about 40 minutes south of Seattle) at Cheney Stadium. Not that there are enough of us to fill a stadium, even a small one, but they have a recently remodeled suite that was about the right size and did catering and a good location for our staff coming from all over Western Washington. The party was nice, well attended and gave us all a chance to catch up and speak to people we rarely see, celebrate two retirements and one 40-year anniversary with the organization. Yes, 40 years, a very dedicated individual. Thick haze all day though. This was the clearest I could get a shot of Rainier, her head was never completely out of the clouds. (another shot of her her on a clearer day http://365project.org/shantwin/365/2011-07-04). On the way home I got a call from one of the twins, André. He's at a protest on the University of Washington campus, hoping I can pick him up!?! Apparently my husband had given permission for this outing to protest cuts to school funding. So, arranged a meeting spot and grabbed him and a a friend of his, then took the friend home to Ballard (all the way across town) and then a stop at the grocery store and finally home to make dinner. André was quite worried I would be upset with him, which I wasn't. Social responsibility is one of the values I was going for when I was raising him so how can I be upset if he's demonstrating it? I don't think most protesters need a ride home from their mommy at the end of the day though, LOL. edit: crop, temp & sat, exp & contrast, lots of work in adjustable threshhold and some HDRish, cross process, I think that's it. Great shot and great editing. I only see this volcano from the freeway so it's hard for me to get a decent shot. Fab shot, funny story, bet not too many mum's are on hand to take protesters home..
Ha ha love the story, what a fabulous view and shot. used to see that all the time when I was stationed at Fort Lewis. nice. Processing looks great! the dark trees in the foreground frame the mountain view beautifully! Love the feel of this shot. Very nice. oooh, very cool! What's that opening title from movies with the stars around a mountain top, this reminds me of it. I agree with Jani, it does look like that! Love the story too! I love this shot and the processing. One of my favorites of the mountain. Your story made me smile...some day he will be dirivng to these events and this will be a memory you will always have! beautiful view!and a nice mommy! beautiful photo of my favorite mountain! and your story reminds me of my parents' advice upon hearing that I was going to my first protest, "if the police come, just do as they say, and try not to get arrested."